Science and Engineering club get their very own school Eden Project! 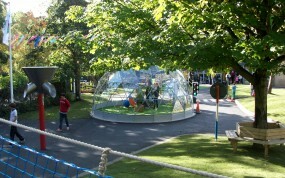 When the members of the Science and Engineering club at Newquay Tretherras School in Cornwall decided to study the construction of the giant Biomes at the nearby Eden Project, little did they suspect that they’d end up with a dome in their own school grounds! Thanks to support from the Science, Technology, Engineering and Maths Network (STEMNET), Science teacher Jenny Ellis Davies and club members explored the mathematical and engineering principles behind the Biomes’ construction and set about creating a model of a dome of their own. 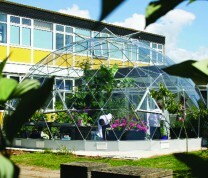 Inspired by the potential of the structure, the school sought help and advice from Solardome Industries. 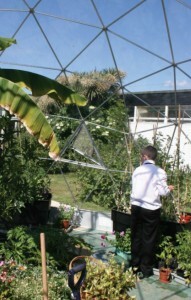 With the help of a £10,000 grant from Awards for All, they purchased a 7.75m diameter geodesic dome and installed it in a quad that was already being developed as an environmental studies area. The Science and Engineering club members were delighted that Tim Smit, co-founder of the Eden Project, was able to inspire their classmates through speaking at their assembly and officially ‘open’ their dome in November 2007. Links with the Eden Project have been maintained, with club members visiting for expert advice on issues such as pest control and becoming actively involved in Eden’s Gardens for Life project. The dome has already housed a wide range of experiments, from exploring the effects of different coloured light on rates of photosynthesis to studying the acoustic properties of the dome itself. Flowers grown within the dome by club members and fed with their home-made fertiliser even took 1st prize at the Royal Cornwall Show! Current projects include powering the dome’s water feature using solar power and installing a gravity-fed irrigation system. The Science and Engineering Club’s project has already proved to be a catalyst for other work within the school. Food Technology students have successfully grown salad crops and are considering upscaling their efforts and supplying produce to the school canteen. Installing a ‘mini-school Eden Project’ required inspiration, commitment and considerable preparation but has already created significant new learning opportunities and a huge sense of achievement. It’s also generated great enthusiasm for additional projects – an underused alternative energy project in a neighboring quad is next on the list to be rejuvenated and members of the Science and Engineering and Gardening clubs are keen to be involved in this work.